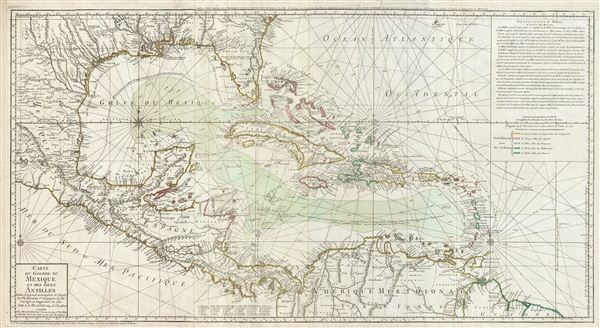 Rare French map detailing the Golden Age of Caribbean Piracy. Carte du Golphe du Mexique et des isles Antilles. A fine example of the 1780 Dezauche edition of Buache's important map of the West Indies. Centered on Cuba, this massive map covers Central America, the Gulf of Mexico, the West Indies, and the Caribbean from Mexico and Texas to the Lesser Antilles and from Florida to the Spanish Main. Cartographically, Buache derived this map from Henry Popple's remarkable 1733 map of North America. As a whole it exhibits numerous significant advances over the earlier Buache / De L'Isle model of the region. These include a more sophisticated mapping of peninsular Florida, the Gulf Coast, and the interior of Texas, Florida, and Mexico. The Mission de Los Teijas, one of the first usages of the word 'Texas' on a published map, is noted. Rumb lines are evident throughout, suggesting this map was also based on sea chart sources. The casual observer might note a similarity in form to Herman Moll's similarly sized 1710 map of the West Indies. Like Moll's map, Buache's map can be understood, though to a lesser extent, in the context of Caribbean piracy and privateering, which reached its zenith in the middle part of the 18th century. Buache identifies the trade winds with little arrows and the routes taken by Spanish Galleons traveling between the treasure ports of Havana and Veracruz. The Spanish treasure fleet entered the Caribbean via the passage between Granada and Trinidad. The fleet then sailed westwards, skirting the Spanish Main until they reached Cartagena, where they rested and provisioned before heading northwards, rounding western Cuba and stopping in Havana. Using the strong Gulf Stream current - shown here - ships would sail northwards from Havana while being steadily forced to the southeast thus alighting at the deep-water port of Veracruz. On the return, laden with silver from the mines of San Luis Potosi, the Spanish fleet took advantage of eastward blowing trade winds, which helped to overcome the strong current on the sail to Havana. From Havana they would travel northwards via the narrow passage between Florida and the Bahamas before cutting eastward and out to sea at St. Augustine. It was here, in this crucial passage between the English dominated Bahamas and Spanish Florida, that the most nefarious pirates lay in wait for their prey. This map was published in J. Dezauche's 1780 reissue of G. De L'Isle and P. Buache's Atlas Geographique et Universel. Delisle, G., and Buache, P., Atlas Geographique et Universel, (Dezauche, Paris), 1789. Very good condition. Original pressmark. Wide clean margins. Original color. Blank on verso. On two sheets joined by publisher.